Have you ever eaten a kohlrabi? These little sputnik-shaped vegetables come in green or purple, can be eaten raw or cooked, and taste a lot like broccoli stems. 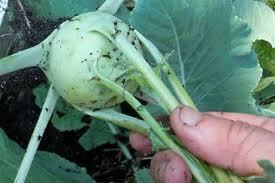 The word kohlrabi is German for cabbage turnip. 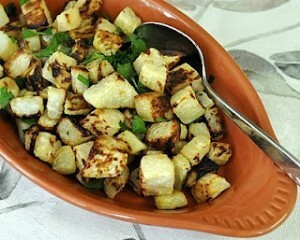 Kohlrabi was a “featured” produce in our Basket of the Week on last Saturday, this is one of our favorite recipes and wanted to share it with you. Set oven to 450F. Toss the diced kohlrabi with olive oil, garlic and salt in a bowl. Spread evenly on a rimmed baking sheet and put into oven (it needn’t be fully preheated) and roast for 30 – 35 minutes, stirring every five minutes after about 20 minutes. Sprinkle with a good vinegar (probably at the table so the kohlrabi doesn’t get squishy). Add some fresh basil before serving.